An international coalition of groups supporting religious freedom made a statement pleading with the Trump administration to prevent Turkey from entering the northeast region of Syria. The International Religious Freedom (IRF) Roundtable wrote a letter last month thanking President Donald Trump for his work on religious freedom but criticizing the decision to pull out of northeastern (NE) Syria and then invite "Turkey to enter the area and create a 20 mile wide ‘safe zone.’"
"Turkey’s actions in Afrin over the last 12 months and its planned military actions in the NE make clear its intention to commit genocide and ethnic cleansing, devastating Christians, Yazidis, and Kurds," the letter declares. "Its entry will destroy the precious religious freedom, human rights, and democracy these minorities created and have enjoyed since 2013 with equal rights for all faiths, ethnicities, and women." Reports indicate Trump decided to withdraw after speaking to Turkish President Recep Tayyip Erdogan, who told him Turkey could handle "clean[ing] up ISIS" in Syria. Calling Turkey’s entry an "existential threat," the IRF Roundtable said the U.S. is going back on its commitment. "This breaks commitments our government made to protect the area and support its democratic aspirations when asking the [Syrian Democratic Forces] to go beyond their historic home territory to fight ISIS," the letter says. "Christians, in particular, seriously debated whether to join this broader battle in light of their already dwindling numbers." The roundtable includes a wide range of religious freedom and human rights organizations, such as the Institute on Religion and Democracy, Law and Liberty Trust, and Jubilee Campaign. 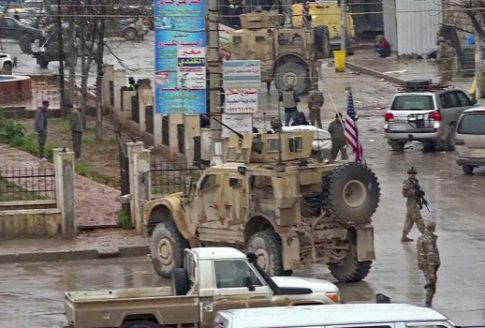 According to their letter, Christians and Kurds in northeastern Syria had made great strides toward democracy with the help of the U.S. military. "Amazingly, their nonsectarian, pluralistic democracy now operates in this entire area: the Self- Administration of North Eastern Syria (SANES)," the letter says. Tying Turkey’s jihadi troops to ISIS, the roundtable expressed in no uncertain terms that the results of Turkey’s expansion would be catastrophic for religious and ethnic minorities, businesses, and women. Turkish jihadi troops (former ISIS and Al Nusra fighters) have stood at the border of SANES for months hurling threats at its residents, promising to behead and fill its defensive trenches with the corpses of SDF soldiers. If it invades, Turkey will do to SANES what it did in Afrin: ethnic cleansing of Kurds, targeting of Christians and Yazidis for genocide, ending democratic institutions and women’s rights, destroying or seizing homes, businesses, lands, and places of worship. Turkey replaced the pre-war predominantly Kurdish Afrin population (over 350,000) with radical Islamists and their families. It drove all Christians and most Yazidis out. Turkey’s actions in Afrin have been documented as deliberate genocide and ethnic cleansing by well respected NGO’s including Genocide Watch and Amnesty International-UK. Besides international NGO’s, the letter also quotes prominent American conservatives, such as Franklin Graham, who are putting pressure on Trump to remain committed to U.S. allies in Syria. Franklin Graham commented on December 26, 2018: "I’m sure that President Trump remembers that during the 2016 campaign he promised to protect Christians. Pulling our troops out of Syria too quickly has the potential to put many in danger." Retired Lt. Gen. William "Jerry" Boykin and Travis Weber of the Family Research Council wrote on the same day: "it stands to put Syria’s Christian community—who have been a target of ISIS—in mortal danger. . . abandoning them now could deal an incalculable blow to our professed concern for Christians being slaughtered by ISIS, and to our reputation as a supporter of religious freedom worldwide." The letter argues a 20-mile safe zone inside Syria "would consume all major NE cities, containing most of its Christians, Kurds, and Yazidis." "We echo local requests (attached) that U.S. forces remain until ISIS is fully crushed and alternative security arrangements are in place," the letter reads. "This means a no fly zone and replacement troops from Global Coalition or Gulf State allies that support the SDF and SANES rather than wishing to destroy them. "Second, your Administration should ensure that SANES representatives participate in Syrian peace talks and can retain their hard won freedoms in post-war Syria," the letter adds. In its conclusion, the roundtable said SANES will have no choice but to ally with the Syrian regime to stop Turkey from destroying it if the U.S. allows Turkey to enter. "If it becomes clear that Turkey will invade the NE, SANES will be forced to yield control to the Assad regime and its allies to avoid annihilation," the letter says. "The SDF will become part of the regime’s army. Hopes for freedom will be shattered. Iran will have its long desired path to the Mediterranean, greater influence in Iraq where it is already squeezing out Christians and Yazidis, and the ability to set up military bases right at the Israel/Syria border, threatening the Jewish state." Religious freedom in a pluralistic society is the best way to deter the revival of ISIS, the roundtable argued. "SANES is a small area in the greater scheme of things. But it is where ISIS was brought to its knees. There, a diverse multi-ethnic, multireligious population found a way to live together," the letter reads. "There, the US-led Coalition and local residents found a common cause. It offers more than a fair chance of being the place where the true antidote to ISIS (religious freedom and democracy) takes root in Syria and the Middle East." This entry was posted in Issues and tagged Religious Freedom, Syria, Trump Administration. Bookmark the permalink.